Marseille, Galerie de l'union des arts, Exposition de la Société artistique des Bouches-du-Rhône, 1862 (titled Le tigre et la tortue). Paris, École nationale supérieure des beaux-arts, Eugène Delacroix: au profit de la souscription destinée à élever à Paris un monument à sa mémoire, March-April 1885, no. 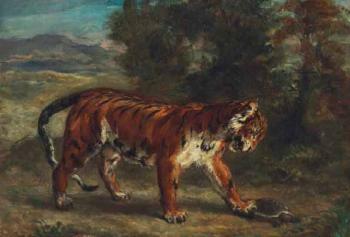 148 (titled Tigre à la tortue and dated 1858). (probably) Berlin, Thannhauser Galleries, Erste Sonderausstellung in Berlin, January-February 1927, p. 54, no. 82 (titled Tiger). Rotterdam, Museum Boymans, Schilderijen van Delacroix tot Cézanne en Vincent van Gogh, December 1933-January 1934, p. 11, no. 26 (titled Tijger en schildpad). Kunsthaus Zürich, Eugene Delacroix, January-April 1939, no. 368 (dated 1858). Kunsthalle Basel, Eugene Delacroix, April-May 1939, no. 264 (illustrated; titled Tiger und Schildkröte). New York, Wildenstein & Co. Inc., Eugene Delacroix, October-November 1944, p. 46, no. 40 (illustrated; titled Tiger Playing with a Turtle). Washington, D.C., Phillips Memorial Gallery, Delacroix, January-February 1945, no. 10 (titled Tiger Playing with a Turtle). Cambridge, The Fogg Art Museum, Harvard University, Between the Empires: Géricault, Delacroix, Chassériau, Painters of the Romantic Movement, April-June 1946, p. 10 (titled Tiger and Turtle). New York, M. Knoedler & Co. Inc., The Artist and the Animal, May 1968, no. 74 (illustrated; titled A Tiger Playing with a Turtle). C. Ponsonailhe, "L'Exposition de l'oeuvre d'Eugène Delacroix" in L'Artiste, 9th series, no. XXIII, 1885, p. 176. A. Robaut and E. Chesneau, L'Oeuvre complet de Eugène Delacroix, Paris, 1885, p. 365, no. 1352 (illustrated with a sketch). 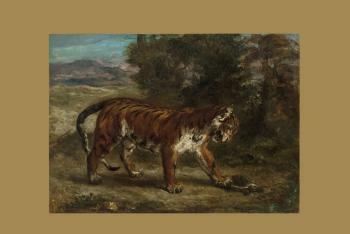 "The Wadsworth Auction: Ancients and Moderns" in ARTnews, December 1948, p. 49 (illustrated; titled Tiger and Turtle). M. Salinger, "The Artist and the Animal: Loan Exhibition at Knoedler" in Arts Magazine, May 1968, p. 29 (illustrated; titled A Tiger Playing with a Turtle). L.R. Bortolatto, L'opera pittorica completa di Delacroix, Milan, 1972, pp. 133-34, no. 799 (illustrated; titled Tigre che stuzzica una tartaruga). M. Potter et al., The David and Peggy Rockefeller Collection: European Works of Art, New York, 1984, vol. I, pp. 109-110, no. 21 (illustrated; titled Tiger with Tortoise). L. Johnson, The Paintings of Eugène Delacroix: A Critical Catalogue, Oxford, 1986, vol. III, p. 31, no. 207 (illustrated, vol. IV, pl. 30; titled Tiger Playing with a Tortoise). M. Fanien (probably Achille Fanien), Paris (April 1872). (possibly) Galerie Durand-Ruel et Cie., Paris. Johann Peter Kaspar Meyer, Dresden (by 1885). Dr. von Dietel, Dresden; sale, Frederik Muller & Cie., Amsterdam, 30 November 1926, lot 11. Paul Cassirer & Co., Berlin (acquired at the above sale). Paul Cassirer & Co., Berlin, and Thannhauser Galleries, Berlin (acquired from the above, by 1927). Jacques Seligmann & Co., New York (acquired from the above, 11 August 1941). Germain Seligmann, New York (acquired from the above, before October 1943). Jacques Seligmann & Co., New York (after 1947); sale, Parke-Bernet Galleries Inc., New York, 11 December 1948, lot 71. Drs. Fritz and Peter Nathan, Zürich. Eugene V. Thaw, New York (acquired from the above, 1965). Acquired from the above by the late owners, February 1966.